More ink practice with darks and lights. Shadowing in comics is, I’m finding, one of the most challenging things to do. There’s a level of committing to the ink that takes a lot of trust. You can tell when a line has been demurely laid down, or not. I like to imagine that the precarity of bacterial existence makes some sense of connectedness one of the few sources of pleasure in an otherwise uncertain and short life. Maybe it begins with a furtive glance from across the colony… followed by cellular fireworks. I write this on the verge of some growing tummy trouble. I’m counting on my immune system to take care of the thing, but in the meantime, I like the image of a micro-drama unfolding—bacteria mingling and rushing to meet their special someones in the little time they have left. Will keep my post short and sweet today. 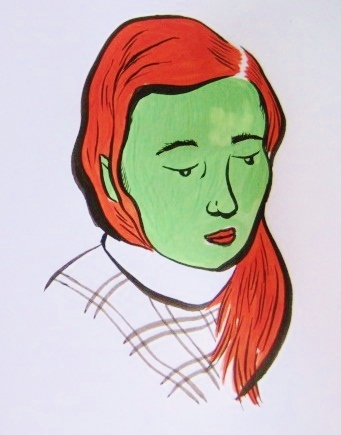 Just a green girl in gouache and ink. Either that’s a turtleneck, or she’s recovering from some form of whiplash. Every December, in Geneva, the city celebrates the Fête de l’Escalade to commemorate its historical military victory over the Duke of Savoy who, in 1602, launched a surprise night-attack on the unsuspecting city-state. To honour this event, there is an annual race and procession given by the Compagnie de 1602. They don stunning 17th century garb and march through the old town with horses, torches, and pipers. Men perform battle re-enactments, cannon-firings, and musketry demonstrations; women sell Escalade pins and plastic cups of mulled wine. The night ends with a fiery speech in the town center declaring Geneva’s enduring independence. 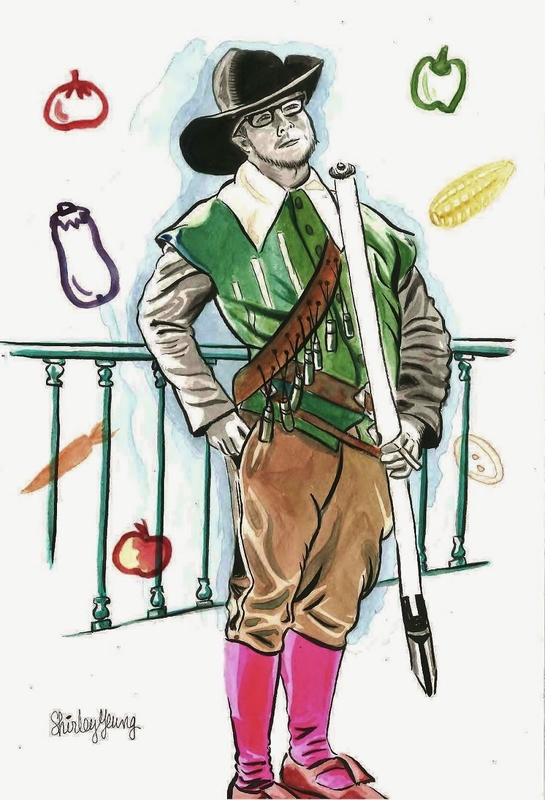 One of the more colourful characters of the Escalade celebrations is Mère Royaume–the semi-fictional cook who, as the folk history goes, was preparing vegetable soup in a large cauldron on the night of the Savoyard ambush. Seeing the approaching Savoyard soldiers attempting to scale the city walls, she roused the slumbering townsfolk, sent for help, and fended off the first attack by pouring her hearty soup–cauldron and all–down onto the approaching climbers. So the story goes. This little tale is why marzipan veggies in a chocolate pot have become one of the Escalade’s official treats. For all of this clarion-calling spectacle, a memorable moment of last year was getting to watch a musketeer on his smoke break. Having just finished a 17th-century style musketry re-enactment, he lit one up in his horn-rimmed glasses and kind of just stared off into space. 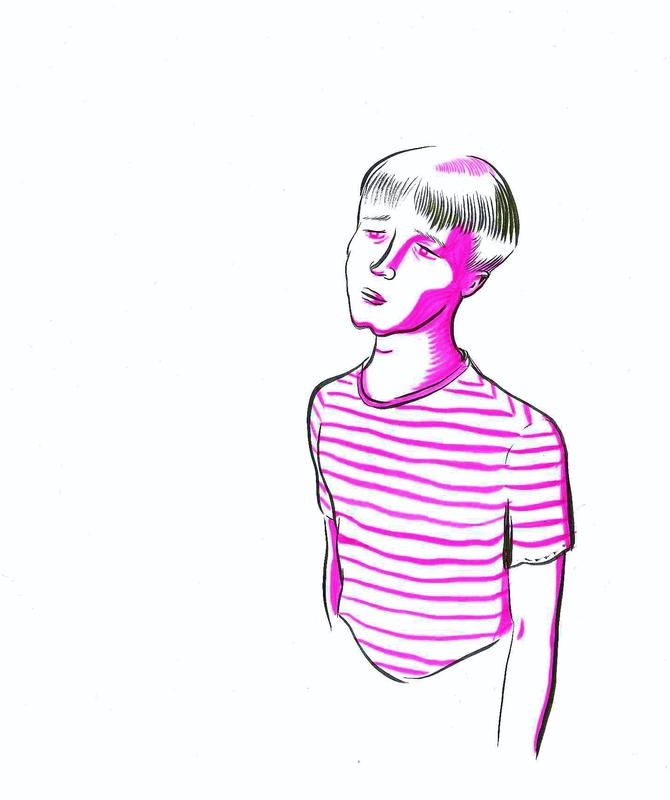 I imagine he was lost in a veggie-filled reverie.